A pencil drawing about "Refugees" by Agim Sulaj has won the £6,000 First prize in the Derwent Prize 2016, sponsored by Derwent Pencils. Prizewinners received their prizes from Eileen Cooper RA, Keeper of the Royal Academy at the Awards Ceremony at the Mall Galleries this evening where the exhibition is being held all this week. Other prizewinners and their artwork can be found below together with more about Agim Sulaj. The work entered must be created in pencil (including water-soluble, pastel, graphite, charcoal or coloured pencils). The work must not exceed 182cms in its greatest dimension. There is no minimum size limit. The Prize is open to both 2 dimensional and 3 dimensional works. All entered work must have been completed within the last 3 years. 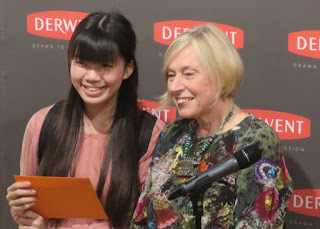 Overall, in my opinion this is the best Derwent Art Prize exhibition yet - and I'll be writing more about it later this week. 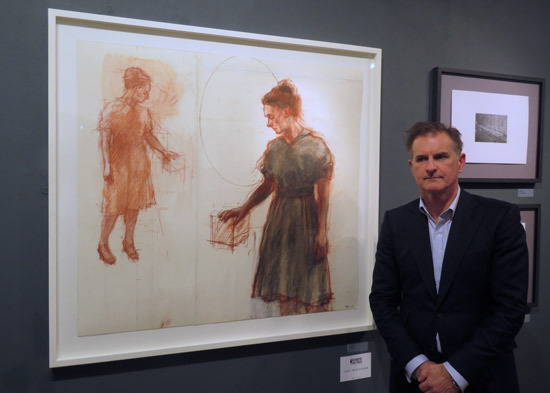 The most noticeable difference this year is that all the main prizewinners are well established artists with a considerable body of work who work in pencil in addition to work in other media. You can also see all the shortlisted works being exhibited this week online - although I can emphatically say you need to visit the gallery to really appreciate the work. The winning work has huge impact visually - even more so when seen in the gallery where it is large (and unframed). 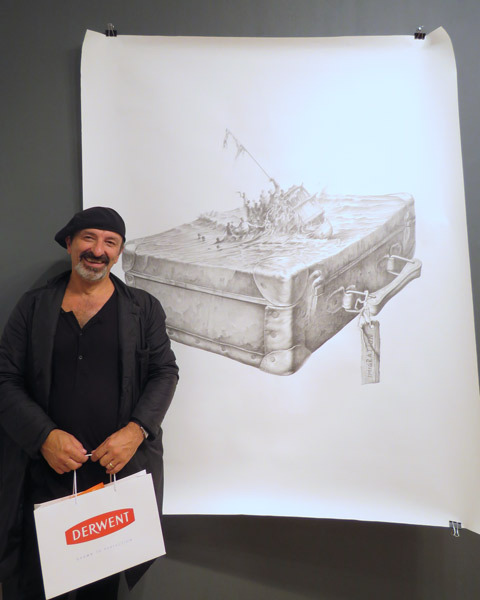 Agim Sulaj with his pencil drawing "Refugees"
I was convinced this work was going to be amongst the prizewinners when I first saw it in the Gallery on the website when the selected works were announced - given both its topicality and the strength of the visual image. The capsizing of the boat full of immigrants reminded me of Turner's The Wreck of a Transport Ship. It certainly seems to me to be a contemporary reworking of a recurrent image in art across the centuries - relating to the potential vulnerability of those who take to the sea. Made more poignant by the fact no immigrant would choose the journey if they had any other option. Bitingly political, his work has captured the imaginations and consciousness of audiences across Europe, Africa, South America and the Middle East. Practice: He creates paintings, cartoons and illustrations. Immigration has been a recurrent theme of his work. Exhibitions: Widely exhibited throughout the world since 1979. Prizes: an award-winning artist who was winning prizes before he graduated and has continued to do so consistently ever since. "This work is dedicated to the refugee drama; the people who are in search of a better life often find a tragic ending. Their dreams drown in the big immigration vortex. As the author of this work, I have experienced immigration when I moved to Italy many years ago, where I faced the harsh reality and the difficulty of adapting to the new “world”, where your best friends are the drawing table and the painting brushes. " Those of us who attended the Awards Ceremony won't forget his reaction to winning the award in a hurry! 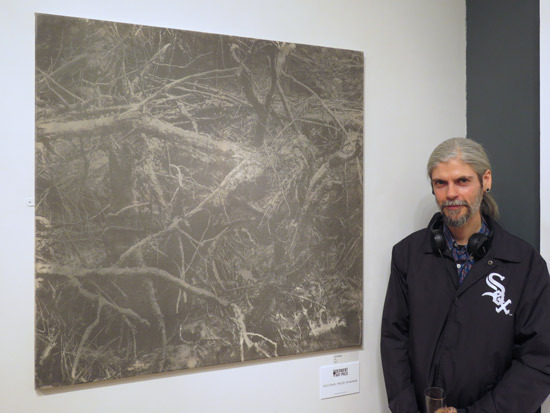 Lee Wagstaff won the Second Prize of £3,500 for Evil - a work in graphite on a fine canvas. 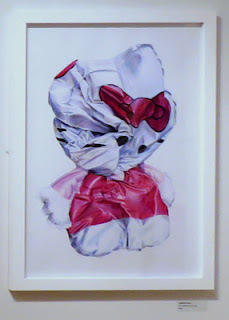 He previously exhibited in the Derwent art Prize 2013.
b. 1969 in London. Now based in Essex. Co-founded the artists project space RISE berlin; Director and curator until 2013. Exhibits his work at fine art and performance art venues worldwide. My academic research compliments my physical practice by exploring the aesthetic and theological dimensions of digitally enabled artefacts. I talked to Lee about this fascinating work and the process he used to develop it. He started with a pack of Derwent Pencils which he stripped of wood and then ground down to create graphite dust. The dust was then applied to a ground on very finely woven material which has been fixed to a board (so that it stays flat during the creation of the work). To do this he used his own unique process of screen printing using graphite (you can see a video of this practice (on paper) developed during a research project about inkless printing during a research artist residency at the Frans Masereel Centre in Kasterlee, Belgium on his website). The graphite is then manipulated on the canvas using a feather duster (above the work - twirled to create air currents which move the graphite dust) and his own fingers. Periodically the graphite dust is stabilised on the canvas using a water spray. All in all, not a conventional drawing or a conventional process! It's certainly does not appear to be one that is easy to emulate! The body, the observed world and their expression assert themselves in Wright’s work as is evident in his winning piece "Helen Schone 14". This award is given for the best artwork from an artist under the age of 25. 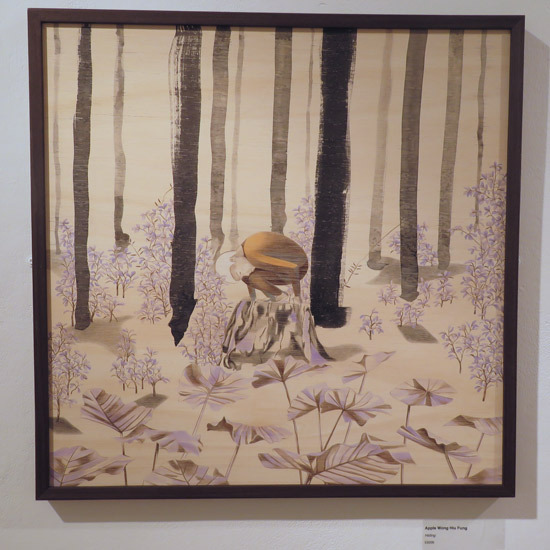 It was won by Hong Kong based Apple Wong Hiu Fung for her piece entitled ‘Hiding ’. Wong’s commitment to experimenting with a variety of media is clear in her winning piece ‘Hiding’, a captivating coloured pencil drawing on wood board. The delicately rendered image of a man crouching in a forest explores abstract concepts such as isolation and separation. Prizes: awarded the Hong Kong Clifton’s Art Prize in 2011. There are two People’s Choice Awards of £750 each. those viewing it online. Visit www.derwent-artprize.com to place your vote. The winners will be announced at the end of the exhibition tour. 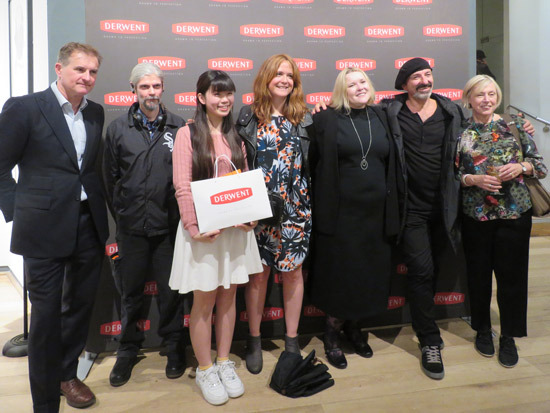 Derwent Art Prize 2014 - ineligible drawing wins first prize? Hi Katherine, the ongoing quality of your blog is astonishing. I'm following it for years and always find something interesting to see, to think about, to dream of. Thank you so much for that. On the Derwent prize, I really prefer the works that are after the first one. Less temporal and more original composition... Just my opinion.